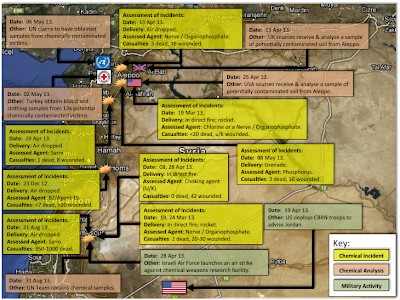 Brown Moses Blog: Syria CW Stockpile on the Move – Russian Help? A guest post by Olly Morton and Hamish de Bretton-Gordon of SecureBio. The Syria Chemical Weapons (CW) saga in 2013 has bought weapons of mass destruction to the forefront of the world’s media however, the threat is no longer constrained to just Syria and its neighbours. As the OPCW and UN begin to oversee the movement of Syria’s CW stockpile out of Syria and destruction on the high seas, proliferation is the major threat to this process and perhaps the Geneva 2 peace talks 22 Jan 14. Russia has come in at the last minute and though this option may be viable will certainly delay things beyond Geneva 2. The international Community is currently being held hostage by Syria’s CW. With the growing threat of extremist organisations drawn to the conflict and the porous land borders has dramatically increased the risk of chemical, biological and radiological proliferation by non-state actors. At the same moment 6400 barrels of radioactive Yellow Cake is discovered unguarded in the deserts of Libya which could be used as part of a Radiological Dispersion Device (RDD), Cobalt 60 is stolen in Mexico, but it looks like Iran will be hindered in its bid to weaponise its enriched Uranium and Plutonium. Proliferation poses a significant threat to regional stability and increases the threat of a “spectacular” terrorist attack against the western world and never before has the terrorist use of WMD been more likely. Unlike Iraq, Syria sought to develop an offensive chemical weapons (CW) capability from the outset; the programme began in 1971, fuelled by growing concerns about regional stability and the immediate threat posed by Israel. Initial development and implementation was supported by Egypt however, with the signing of an agreement with the Soviet Union and the development of the Tartus naval base, expertise from the USSR was provided and Syria began a programme of CW self-sufficiency. 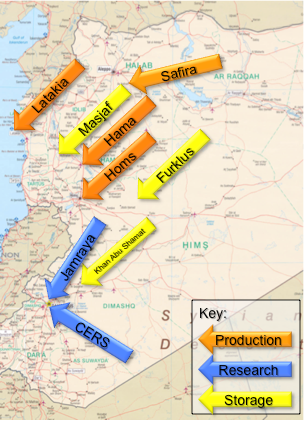 In addition to its chemical weapons programme, Syria also developed an extensive biological and pharmaceutical programme however, unlike the CW programme, there is little evidence to support its use as a stand-alone offensive capability but the possibility of dual-use is extremely high. Prior to the civil war, Syria had one of the largest pharmaceutical industries in the region, with a number of the research and production facilities capable of rapidly converting from pharmaceutical research and manufacturing, in particular vaccine work, to producing biological warfare agents; these facilities are known as dual-use. Prior to the development of its chemical weapons programme, Syria had signed the nuclear non-proliferation treaty in 1968 and went on to ratify it in 1969, enabling them to pursue peaceful civil nuclear power. By the mid-1980’s Syria had engaged with Argentina, China and Russia in the search for nuclear technologies and expertise, construction began in 1991 on the Chinese Der Al-Hadjar reactor, which became operational in 1996 however, despite the peaceful persona, in 2007 Israel bombed another reactor at Al-Kibar. Al-Kibar was assessed, by the CIA, to be a plutonium production reactor; the facility was developed in secrecy and had been strictly off limits to international nuclear inspectors, consequently very little was known about it. Following the 2007 air strike and a series of worrying discoveries by the International Atomic Energy Agency (IAEA), relationships began to breakdown and in June 2011 the IAEA passed a resolution that found Syria to be non-compliant with the nuclear Safeguards Agreement – this has all gone quite at the moment but no doubt with IAEA focus on Iran, the next stage of Syria WMD verification will no doubt look at this programme. In the past 12 months, UK Government has estimated that there have been approximately 14 chemical attacks, supported by positive sample analysis from at least 3 of these attack locations. Of concern, is that these repeated attacks do not follow a standard modus-operandi but utilise a variety of delivery means, agents and target locations, with the most horrific attack occurring on 21 Aug 2013 in the Damascus suburb of Al Ghouta. Due to the variety and nature of the attacks, attributing blame and conducting accurate threat assessments is challenging until Al Ghouta. This number of attacks and the scale of the atrocity on 21 August has led to increased media coverage, which coupled with the break down of security, policing and border controls has fuelled international speculation and concern about the threat of CBRN proliferation from Syria. The base at Safira has changed hands on numerous occasions, but what remains unclear is where the stockpiled chemical weapons and their precursors are? For historical security and internal stability reasons the regime dispersed its CBRN programmes across the country, ensuring that research, production, storage and delivery means remained separated. The on-going civil war has caused a breakdown of physical security at a number of CBRN production, storage and research facilities and Syria’s growing extremist threat (both regime and opposition aligned), has enabled non-state actors to have access to Syrian WMD, their associated toxic pre-cursor chemicals and other toxic industrial materials. Recently even the more moderate opposition activists, view the possession of CBRN weapons as critical to the long-term survival of Syria and the perceived threat posed by Israel. Open source reporting has suggested that many chemical weapons, precursors and CBRN hazards have already left the country, utilising the worrying combination of porous borders and lack of security; additional reporting has indicated a growing confidence to attack manned government controlled border posts. Of significance has been two high prolife arrests made in May and June of this year, the first was the capture of Al Nusrah members in Turkey, on 31 May 13, who were found to be in possession of 2kgs of Sarin. The second set of arrests were made in Iraq, resulting in the capture of an Al Qaeda (AQ) cell in Baghdad, who were found to be in possession of Sarin pre-cursor chemicals and a complex plan of attack using remote controlled aircraft. More recently, a Lebanese paper (Al-Mustaqbal) reported that 20 trucks, carrying CW manufacturing equipment and materials, crossed into Iraq. Where did they go? There are many who believe that the Regime has not declared all their CW to the OPCW and that not all of Assad’s CW are currently being centralised and moved to Latakia for disposal. However, the greatest ‘opportunity for proliferation is going to come over the next 3 weeks when Syria’s CW stockpile is moved to the Port of Latakia. This is about a 300Km journey through at least 2 Opposition held areas. Military planning yardsticks would suggest this journey if planned and executed by, say by a NATO force or Russian (if available immediately), would expect to take around 3 weeks. Therefore, to arrive at Latakia in time to be loaded onto a Danish ship and be out of Syria by 31 Dec 13, this operation must start TODAY. SecureBio have already written on the dynamics of this operation here. Probably the biggest threat to the convoy will be powerful roadside bombs, which can be big enough to blow 60 tonnes tanks several metres in the air. A powerful explosion like this would undoubtedly destroy all the mustard gas in the targeted vehicle but the confusion, mayhem and slaughter would undoubtedly provide the opportunity to take some of the other trucks carrying CW material. 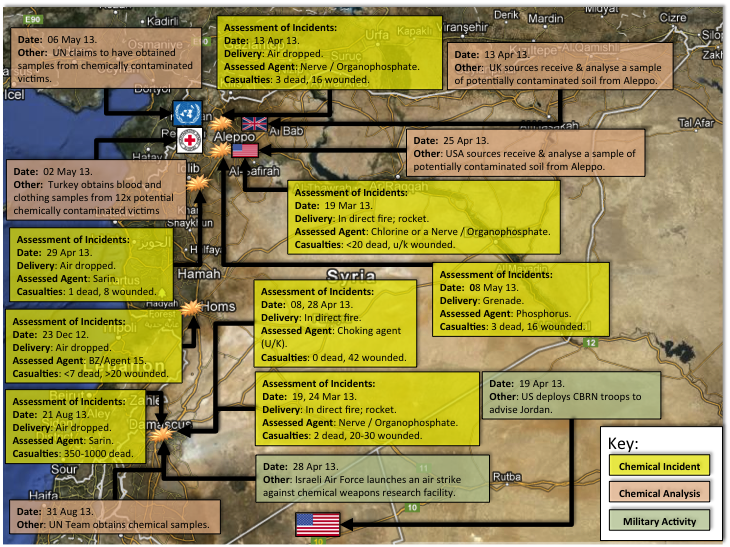 This element is covered in more detail on Syria Deeply. The regime’s request last week for military capability to protect this convoy is either a delaying tactic or they know it is going to fail and are looking for reasons to justify this failure. Once the CW is on the ‘High Seas’ the Danish vessel which has collected them will have to steam around the Mediterranean until at least the end of Jan 14 when the MV Cape Ray turns up to destroy the 30 tonnes of Mustard Gas and 600 tonnes of Priority One toxic precursor chemicals. There is a suggestion that this transfer of CW make take place at sea which could be a highly risk operation and the thought of 30 tonnes of mustard gas being lost in the Eastern Mediterranean is probably something which can ‘not’ be allowed to happen. The size of the Syrian border, its porous nature, lack of security and willingness for activists to challenge border security (where it exists) presents a significant risk to regional stability and potentially even global travel through the proliferation of CBRN agents from Syrian facilities. Many of the CBRN agents appear benign and are readily transportable in sealed containers; Sarin is a clear liquid marginally thicker than water. The benign appearance, combined with current security screening at international borders, which have been developed to counter the trafficking of narcotics, explosives and radioactive isotopes, facilitates the transportation of small amounts of chemical and biological with relative ease. Due to this security black hole, once chemical biological warfare (CBW) agents have been proliferated out of Syria, their onward movement is all but impossible to track and interdict. The associated difficulties of identifying, tracking and interdicting these CBW agents, once proliferated from Syria, makes mitigation within current security regimes extremely challenging. The OPCW receives the Nobel Peace Prize on Tues 10 Dec 13, let’s hope this is not tarnished by what happens in the next 3 weeks and 6 months, and the previous 16 years of outstanding service keep the Chemical Warfare Convention ‘Flame Alive’. The Russians have come in at the last minute to potentially offer protection to the convoy, this is a big call given their experiences in Afghanistan and the Chechnya. But probably the only viable option at the moment. They were not caught with sarin gas in turkey, they were caught with antifreeze which is apperantly a precursor to sarin. Yellow cake is an extremely poor candidate for a RDD. The theft in Mexico was aimed at the truck, not its Co-60 cargo. "Cos said unknown chemical materials were found during the raids and sent away for investigation. He denied media reports that a small amount of the nerve agent sarin had been uncovered."